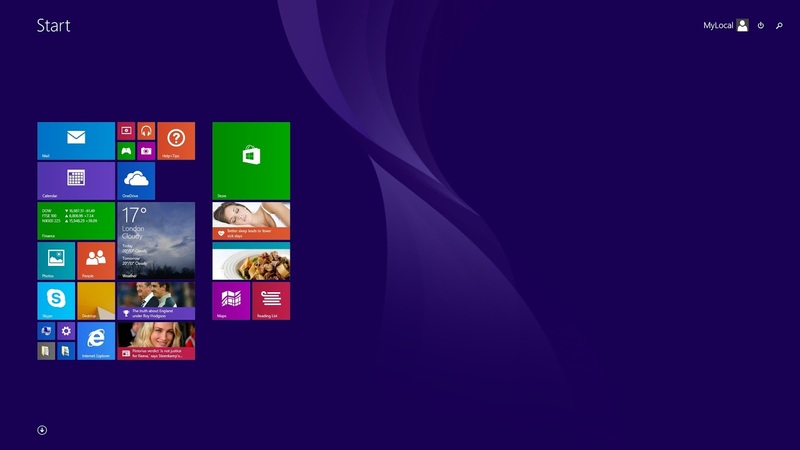 Following my first post about Typography in Windows 8, I would like in this post to talk more about colors and the tile concept in Windows Phone and Windows 8.x. First remark, it looks empty. We know the problem for a long time: this was designed for smaller form factors - Windows Phone but unfortunately we got it as-is on desktop. Second remark, we also start to get a glimpse of the color problem with the Metro/Tile concept: It looks flashy. You have probably seen some leaks of screenshots of the next Windows and while this could be - or not - the technical preview that is going to be released later this month for enterprise preview, I have been a bit shocked by the poorness of the UI visuals. Lots of commentators are saying that Microsoft is usually tweaking the OS UI few months before releasing to the public, fine, but I hope this technical preview will unveil a better sneak peak of next Windows UI. If it does not, that's really an unfortunate move, because all these images are already generating misunderstanding. We are lots around waiting and watching for the next Windows. We are not just waiting for the desktop to come back, we are waiting for something that will make us happy and excited! I'm not a UI designer, I'm just a developer using Windows, but I love good visuals and I'm concerned by the OS UI that accompanies me all along more than 12 hours per day! I won't comment more on the next Windows OS, but I would like to take the opportunity to share some of the unpleasant things I'm feeling about for the past years with the Windows Metro UI era. In the sequel of my previous post "Managing multiple platforms in Visual Studio", having done lots of cross-platform development in .NET in the recent years both at work or for SharpDX (with platform specific assemblies, PCL, assemblies using native compiled code... etc) while trying to trick and abuse nuget and msbuild as much as possible, I have realized that in order to provide a smooth integration of "build packages", this require to be more tightly integrated at the core of a build system. Unfortunately, we only have today a patchwork of this integration, still quite incomplete and far from what it could be, and this is hurting a lot our development process. We really need something brand new here: we have lots of inputs, usecases, and while it is of course not possible to cover every aspects of all build workflows, It is certainly possible to address most of the common issues we are facing today. Let's try to figure out where this could lead! While .NET JIT is performing quite well on Windows, it is still behind a fully optimized C++ program, though an efficient compiled program is not only about code generation but also memory management and data locality, the .NET Team has recently introduced two new technologies that might help for the code gen part: The introduction of .NET Native, an offline .NET compiler (similar to ngen, but using the backend optimizer that is used by the C++ compiler) and the next generation of .NET JIT called "RyuJit". In this post I would like to present the results of some micro-benchmarks that are roughly evaluating some performance benefits of these two new technologies. Who has not struggled to correctly manage multiple platform configurations in Visual Studio without ending to edit a solution file or tweak some msbuild files by hand? Recently, I decided to cleanup the antique SharpDX.sln in SharpDX that was starting to be a bit fat and not easy to manage. The build is not extremely bizarre there, but as it needs to cover the combinations of NetPlatform x OSPlatform x DirectXVersion x Debug/Release with around 40 projects (without the samples), it is an interesting case of study. It turns out that modifying the solution to make a clean multi-platform build was impossible without hacking msbuild in order to circumvent unfortunate designs found in Microsoft msbuild files (and later to found at work in Xamarin build files as well). In this post, we will go through the gotchas found, and we will see also why Visual Studio should really improve the configuration manager if they want to improve our developers experience. Let’s just begin by revisiting recent history of managed development that will highlight current challenges. Remember the Java slogan? “write once runs everywhere”, it was the introduction of a paradigm where a complete “safe” single language-stack based on a virtual machine associated with a large set of API would allow to easily develop an application and target any kind of platforms/OS. It was the beginning of the “managed” era. While Java has been quite successfully adopted in several development industries, it was also quite rejected by lots of developers that were aware of memory management caveats and the JIT not being as optimized as it should be (though they did some impressive improvements over the years) with also a tremendous amount of bad design choice, like the lack of native struct, unsafe access or the route to go native through JNI extremely laborious and inefficient (and even recently, that they were considering to get rid off all native types and make everything an object, what a terrible direction!). Multi-threading is an important feature added to Direct3D11 two years ago and has been increasingly used on recent game engine in order to achieve better performance on PC. You can have a look at "DirectX 11 Rendering in Battlefield 3" from Johan Anderson/DICE which gives a great insight about how it was effectively used in practice in their game engine. Usage of the Direct3D11 multithreading API is pretty straightforward, and while we are also using it successfully at our work in our R&D 3D Engine, I didn't take the time to sit down with this feature and check how to get the best of it. I recently came across a question on the gamedev forum about "[DX11] Command Lists on a Single Threaded Renderer": If command lists are an efficient way to store replayable drawing commands, would it be efficient to use them even in a single threaded scenario where lots of drawing commands are repeatable? Since my last post is quite old, it's time to give more insight about the latest features included in the recent release of SharpDX 2.0 beta. This release is a major step for SharpDX as it includes lots of new APIs but also provides a preview of developing Managed DirectX from a Windows 8 Metro style application. In the meantime, I have been pretty busy as I got a job in a gamedev company located in Japan that is developing a new rendering engine in C#... which is using SharpDX for its windows rendering, and that's extremely exciting to work on a project like this (and of course rewarding for all the investement done in SharpDX!). While SharpDX is starting to cover almost the whole DirectX API as well as some new Windows Multimedia API (like WIC), I put some effort, just after the Microsoft Build conference, on providing a preview of using SharpDX from a Win8 Metro style application, which is a fantastic opportunity for a C#/.Net developer to use DirectX from both a Metro style application and Desktop application using the same API. Finally SharpDX is also going to get some new APIs and some interesting features in the following months, especially in the performance domain, to reduce as much as possible the difference of performance between a native C++ DirectX application and a managed C# DirectX application, that will deserve a post on its own. But lets start with what has been achieved in the latest 2.0 version! If you are working with a managed language like C# and you are concerned by performance, you probably know that, even if the Microsoft JIT CLR is quite efficient, It has a significant cost over a pure C++ implementation. If you don't know much about this cost, you have probably heard about a mean cost for managed languages around 15-20%. If you are really concern by this, and depending on the cases, you know that the reality of a calculation-intensive managed application is more often around x2 or even x3 slower than its C++ counterpart. In this post, I'm going to present a micro-benchmark that measure the cost of calling a native Direct3D 11 API from a C# application, using various API, ranging from SharpDX, SlimDX, WindowsCodecPack. Why this benchmark is important? 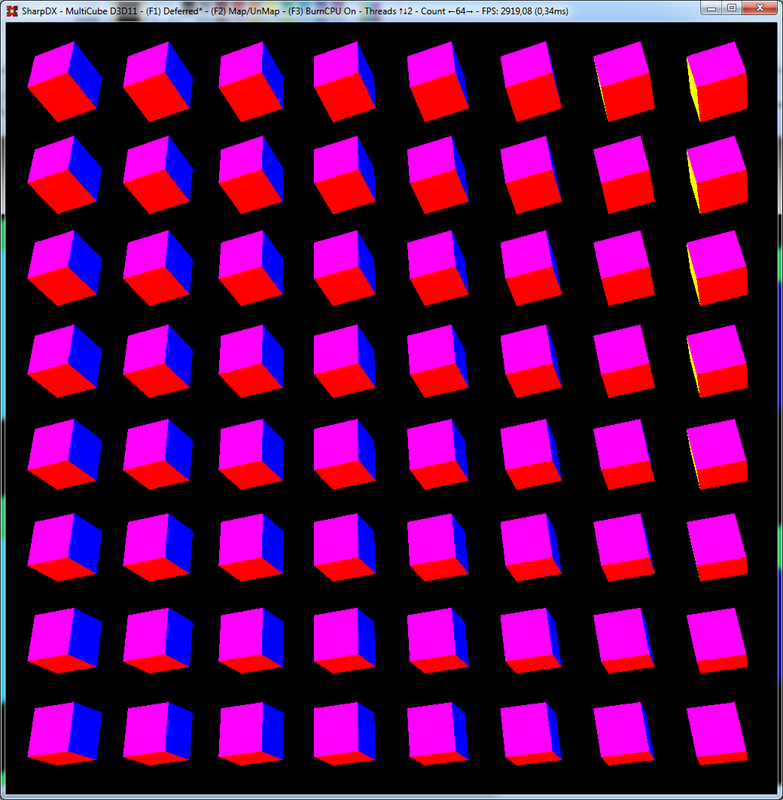 Well, if you intend like me to build some serious 3D games with a C# managed API (don't troll me on this! ;) ), you need to know exactly what is the cost of calling intensively a native Direct3D API (mainly, the cost of the interop between a managed language and a native API) from a managed language. If your game is GPU bounded, you are unlikely to see any differences here. But if you want to apply lots of effects, with various models, particles, materials, playing with several rendering targets and a heavy deferred rendering technique, you are likely to perform lots of draw calls to the Direct3D API. For a AAA game, those calls could be as high as 3000-7000 draw submissions in instancing scenarios (look at latest great DICE publications in "DirectX 11 Rendering in Battlefield 3" from Johan Andersson). If you are running at 60fps (or lower 30fps), you just have 17ms (or 34ms) per frame to perform your whole rendering. In this short time range, drawing calls can take a significant amount of time, and this is a main reason why multi-threading batching command were introduced in DirectX11. We won't use such a technique here, as we want to evaluate raw calls. If you are not familiar with 4k intros, you may wonder how things are organized at the executable level to achieve this kind of packing-performance. Probably the most important and essential aspect of 4k-64k intros is the compressor, and surprisingly, 4k intros have been well equipped for the past five years, as Crinkler is the best compressor developed so far for this category. It has been created by Blueberry (Loonies) and Mentor (tbc), two of the greatest demomakers around. I just had a basic knowledge about compression, probably the last book I bought about compression was more than 15 years ago to make a presentation about jpeg compression for a physics courses (that was a way to talk about computer related things in a non-computer course!)... I remember that I didn't go further in the book, and stopped just before arithmetic encoding. Too bad, that's exactly one part of crinkler's compression technique, and has been widely used for the past few years (and studied for the past 40 years! ), especially in compressors like H.264! So wow, It took me a substantial amount of time to jump again on the compressor's train and to read all those complicated-statistical articles to understand how things are working... but that was worth it! In the same time, I spent a bit of my time to dissect crinkler's decompressor, extract the code decompressor in order to comment it and to compare its implementation with my little-own-test in this field... I had a great time to do this, although, in the end, I found that whatever I could do, under 4k, Crinkler is probably the best compressor ever. You will find here an attempt to explain a little bit more what's behind Crinkler. I'm far from being a compressor expert, so if you are familiar with context-modeling, this post may sounds a bit light, but I'm sure It could be of some interest for people like me, that are discovering things like this and want to understand how they make 4k intros possible! After three months of intense development, I'm really excited to announce the availability of SharpDX 1.0 , a new platform independent .Net managed DirectX API, directly generated from DirectX SDK headers. This first version can be considered as stable. The Direct3D10 / Direct3D10.1 API has been entirely tested on a large 3D engine that was using previously SlimDX (thanks patapom!). Migration was quite straightforward, with tiny minor changes to the engine's code. API is generated from DirectX SDK headers : meaning a complete and reliable API and an easy support for future API. Pure managed .NET API, platform independent : assemblies are compiled with AnyCpu target. You can run your code on a x64 or a x86 machine with the same assemblies, without recompiling your project. Lightweight individual assemblies : a core assembly - SharpDX - containing common classes and an assembly for each subgroup API (Direct3D10, Direct3D11, DXGI, D3DCompiler...etc.). Assemblies are also lightweight. C++/CLI Speed : the framework is using a genuine way to avoid any C++/CLI while still achieving comparable performance. API naming convention mostly compatible with SlimDX API. Raw DirectX object life management : No overhead of ObjectTable or RCW mechanism, the API is using direct native management with classic COM method "Release". Easily mergeable / obfuscatable : If you need to obfuscate SharpDX assemblies, they are easily obfusctable due to the fact the framework is not using any mixed assemblies. You can also merge SharpDX assemblies into a single exe using with tool like ILMerge. You will also find a growing collection of samples in the Samples Gallery of SharpDX. Most notably with some additional support for Direct2D1 and DirectWrite client callbacks. Next versions will provide support for DirectInput, XInput, X3DAudio, XACT3. Someone asked me how SharpDX compares to SlimDX in terms of performance. Here is a micro-benchmark on two methods, ID3D10Device1::GetFeatureLevel (alias Device.FeatureLevel) and ID3D10Device::CheckCounterInfo (alias Device.GetCounterCapabilities). The test consist of 100,000,000 calls on each methods (inside a for, with (10 calls to device.FeatureLevel) * 10,000,000 times) and is repeated 10 times and averaged. Repeated two times. For FeatureLevel, the test was sometimes around +/-0.5%. For GetCounterCapabilities(), the main difference between SharpDX and SlimDX implementation is that SlimDX perform a copy from the native struct to .Net struct while SharpDX is directly passing a pointer to the .Net struct. This test is of course a micro benchmark and doesn't reflect a real-world usage. Some part of the API could be in favor of SlimDX, but I'm pretty confident that SharpDX is much more consistent in the way structures are passed to the native functions, avoiding as much as possible marshaling structures that doesn't need any custom marshaling (unlike SlimDX that is performing most of a time a marshaling between .Net/Native structure, besides they are binary compatible). Finally, I'm going to be able to use this project to make some demos with it! 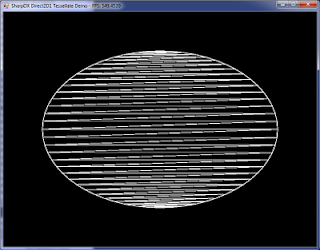 Next target is to develop a XNA like based framework based on SharpDX.Direct3D11. If you have followed my previous work on a new .NET API for Direct3D 11, I proposed SlimDX team this solution for the v2 of their framework, joined their team around one month ago, and I was actively working to widen the coverage of the DirectX API. I have been able to extend the API coverage almost up to the whole API, being able to develop Direct2D samples, as well as XAudio2 and XAPO samples using it. But due to some incompatible directions that the SlimDX team wanted to follow, I have decided to release also my work under a separate project called SharpDX. Now, you may wonder why I'm releasing this new API under a separate project from SlimDX? Well, I have been working really hard on this from the beginning of September, and I explained why in my previous post about Direct3D 11. I have checked-in lots of code under the v2 branch on SlimDX, while having lots of discussion with the team (mostly Josh which is mostly responsible for v2) on their devel mailing list. The reason I'm leaving SlimDX team is that It was in fact not clear for me that I was not enrolled as part of the decision for the v2 directions, although I was bringing a whole solution (by "whole", I mean a large proof of concept, not something robust, finished). At some point, Josh told me that Promit, Mike and himself, co-founders of SlimDX, were the technical leaders of this project and they would have the last word on the direction as well as for decisions on the v2 API. Unfortunately, I was not expecting to work in such terms with them, considering that I had already made 100% of the whole engineering prototype for the next API. From the last few days, we had lots of -small- technical discussions, but for some of them, I clearly didn't agree about the decisions that were taken, whatever the arguments I was trying to give to them. This is a bit of disappointment for me, but well, that's life of open source projects. This is their project and they have other plans for it. So, I have decided to release the project on my own with SharpDX although you will see that the code is also currently exactly the same on the v2 branch of SlimDX (of course, because until yesterday, I was working on the SlimDX v2 branch). But things are going to change for both projects : SlimDX is taking the robust way (for which I agree) but with some decisions that I don't agree (in terms of implementation and direction). Although, as It may sound weird, SharpDX is not intended to compete with SlimDX v2 : They have clearly a different scope (supporting for example Direct3D 9, which I don't really care in fact), different target and also different view on exposing the API and a large existing community already on SlimDX. So SharpDX is primarily intended for my own work on demomaking. Nothing more. I'm releasing it, because SlimDX v2 is not going to be available soon, even for an alpha version. On my side, I'm considering that the current state (although far to be as clean as It should be) of the SharpDX API is usable and I'm going to use it on my own, while improving the generator and parser, to make the code safer and more robust. which is pretty cool, considering the amount of code (although the Direct3D 10 and D2D initialization part would give a larger code), I found this to be much simpler than the gluTessellation API. You will find also some other samples, like the XAudio2 ones, generating a synthesized sound with the usage of the reverb, and even some custom XAPO sound processors! You can grab those samples on SharpDX code repository (there is a SharpDXBinAndSamples.zip with a working solutions with all the samples I have been developing so far, with also MiniTris sample from SlimDX). Disclaimer about this hack: This hack was nothing more than a proof of concept and I *really* don't have time to dig into any kind of bugs related to it. 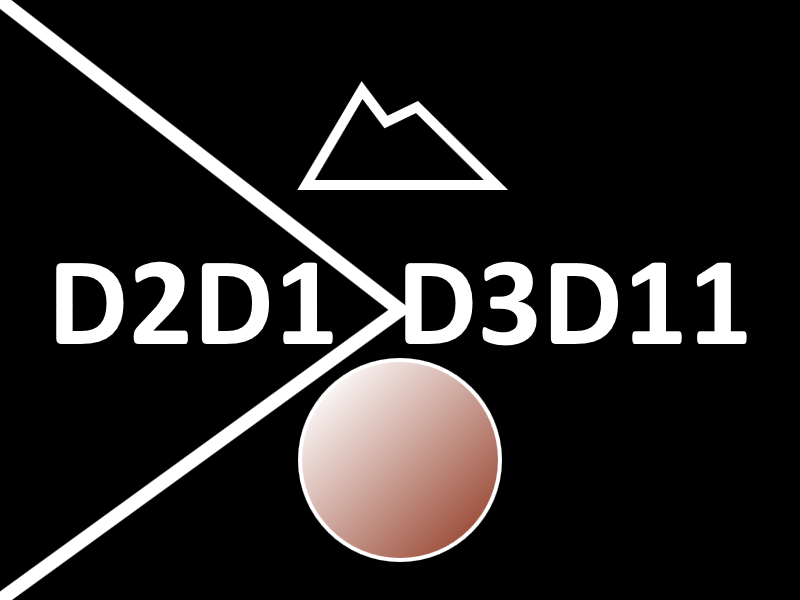 If you know Direct3D 11 and Direct 2D - they were released almost at the same time - you already know that there is a huge drawback to use Direct 2D : It's in fact only working with Direct3D 10.1 API (although It's working with older hardware thanks to the new feature level capability of the API). Ever wanted to implement a C++ interface callback in a managed C# application? Well, although that's not so hard, this is a solution that you will probably hardly find over the Internet... the most common answer you will get is that it's not possible to do it or you should use C++/CLI in order to achieve it... In fact, in C#, you can only implement a C function delegate through the use of Marshal.GetFunctionPointerForDelegate but you won't find anything like Marshal.GetInterfacePointerFromInterface. You may wonder why do I need such a thing? 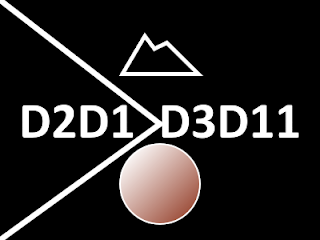 ID3DInclude which is used by D3DCompiler API in order to provide a callback for includes while using preprocessor or compiler API (see for example D3DCompile). 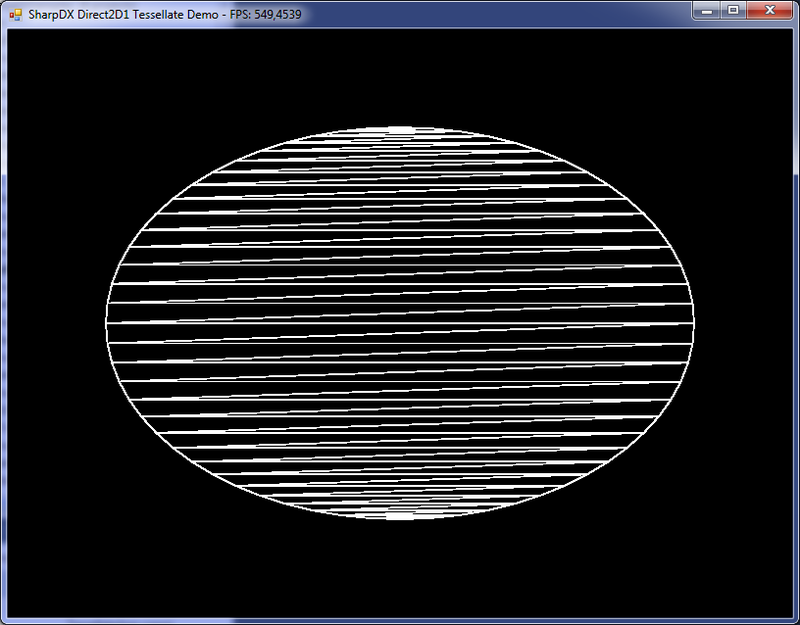 So I'm going to take the example of ID3DInclude, and how It has been successfully implemented for the SharpDX. Array.Copy, although It's not relevant because they don't have the same scope. Array.Copy is managed only for arrays only while memcpy is used to copy portion of datas between managed-unmanaged as well as unmanaged-unmanaged memory. Buffer.BlockCopy, which is working on managed array but is working with a byte size block copy. 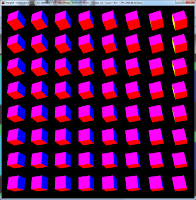 The test is performing a series of memcpy with different size of block : from 4 bytes to 2Mo. The interesting part is to run this test on a x86 and x64 mode. Both tests are running on the same Windows 7 OS x64, same machine Intel Core I5 750 (2.66Ghz). The CLR used for this is the Runtime v4.0.30319. Don't be afraid about the performance drop for most of the implem... It's mostly due to cache missing and copying around different 4k pages. On x64, you should better use a cpblk function, which is performing better from small size (twice faster than memcpy) to large size. You may wonder why the x86 version is so unoptimized? This is because the x86 CLR is generating a x86 instruction that is performing a memcpy on a PER BYTE basis (rep movb for x86 folks), even if you are moving a large memory chunk of 1Mo! In comparison, a memcpy as implemented in MSVCRT is able to use SSE instructions that are able to batch copy with large 128 bits registers (with also an optimized case for not poluting CPU cache). This is the case for x64 that seems to use a correct implemented memcpy, but the x86 CLR memcpy is just poorly implemented. Please vote for this bug described on Microsoft Connect. One important consequence of this is when you are developping a C++/CLI and calling a memcpy from a managed function... It will end up in a cpblk copy functions... which is almost the worst case on x86 platforms... so be careful if you are dealing with this kind of issue. To avoir this, you have to force the compiler to use the function from the MSVCRTxx.dll. Also, I didn't perform this test on a CLR 2 runtime... we could be surprised as well... There is also one thing that I should try against a pure C++ memcpy using the optimized SSE2 version that is shipped with later msvcrt.